Sonoma's Russian River spilled over into nearby vineyards this week. We're sure having a lot of weather these days, aren't we? There has been a tundra of biting cold and heavy snow through much of the country; meanwhile, if it keeps raining in Northern California we'll be converting inches to cubits. California has experienced a series of back-to-back storms, what the TV weather folks call an "atmospheric river" or "pineapple express" from Hawaii. Sonoma County was among the hardest hit, getting a soaking of nearly 13 inches from Friday through early Monday. River Road and other thoroughfares near the Russian River in Sonoma County were also blocked by flooding or mudslides. Wineries in Russian River Valley are keeping an eye on the swollen creeks that feed into it. Clogged with water and debris, they cause much of the flooding in the region. The National Weather Service predicted the Russian would pass 38 feet last night-6 inches above the flood stage. Driving through Sonoma Valley Monday morning, I spotted a vineyard irrigation pond so overflowing that the relief valve was open and gushing water. The ground is so saturated that there's no place for the water to go. 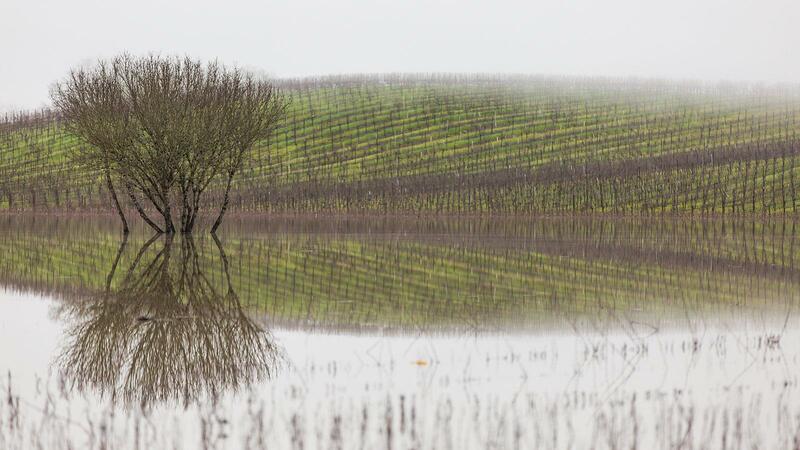 Low-lying vineyards are flooded all around Sonoma, Napa and Mendocino. That's fine with growers and winemakers like Mike Officer, whose vines near his Carlisle Winery were wading in the rain. There was a pool building in a low spot near the winery, too. Officer decided to get a new sump pump just in case. Despite all that, officials say the drought is not over, and many of us are beginning to wonder what the hell it will take. There was one good sign this week. A dam on the Sacramento River was opened for the first time in more than a decade to relieve pressure on bulging levees. The sun is supposed to return Friday. We'll be ready for it. As a Sonoma resident, I welcome the rain but not the "monsoon"-like wind blown torrential downpours. The weather is still warm and my grass is back to growing. Last night we heard thunder like the heavens were hosting a huge bowling banquet. The good news is the much needed water is a huge help and hillsides are luscious green with happy cows, sheep and horses. Of course even the "vines" are saying enough is enough. This does not relate to this blog post, but not sure where else to place it as your contact info is not on the website as far as I can tell. We frequently receive Miraflores wine through their club, all of which has been great and consistent with your tasting notes. However, there is an inconsistency between your recent note and the winery information on the 2014 Method Ancienne. That wine is 100% syrah according to the information from the winery, whereas your note indicates a blend. Also, an interesting side bit of information is that it is a foot stomped wine fermented with wild yeast.